It was a civilian that did the shooting on Thursday evening across the country in Las Vegas, where two suspects approached a man who had just purchased a big-screen television from a local Target store and fired warning shots. According to a local CBS affiliate, the two suspects stole the newly purchased TV and tried to take off with it in their car, but the victim approached them and attempted to recover it himself, prompting one of the thieves to shoot several times, sending the man to a local hospital with non-life-threatening injuries as well. 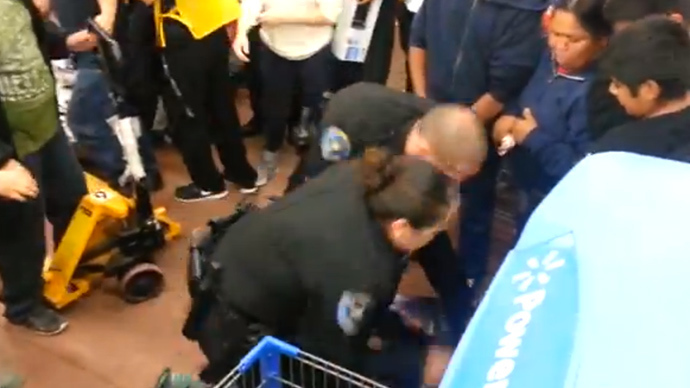 In Rialto, California, police handled no fewer than three brawls at a single Walmart before 8 p.m., one of which ended with an officer being sent to the hospital with a broken wrist. 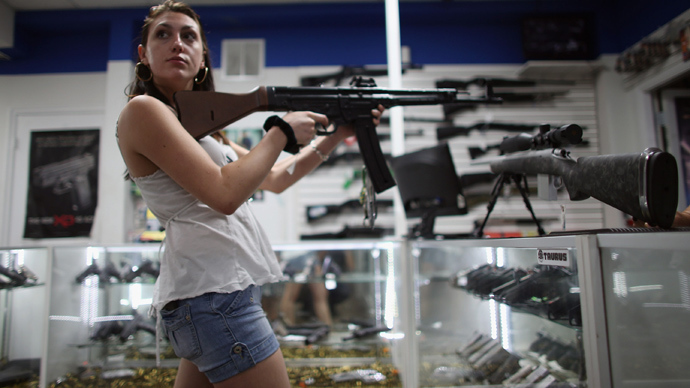 He suffered his injury after attempting to break up one of a handful of altercations, and cops had to arrest several men at the store for a series of charges, according to the San Bernardino Sun, including suspicion of assault with a deadly weapon for one man. 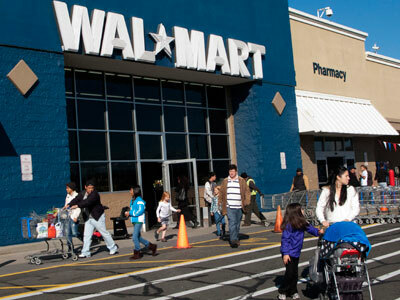 Walmart spokeswoman, Betsy Harden, told the Sun that “The fight at the Rialto store was an unfortunate and isolated incident to an otherwise very safe event,” and insisted that “Providing our customers with the best and safest shopping experience is always our top priority.” Reports from elsewhere suggest stores of all sorts played host to violent acts this Black Friday, however, including at least another two at other Walmart retail centers. 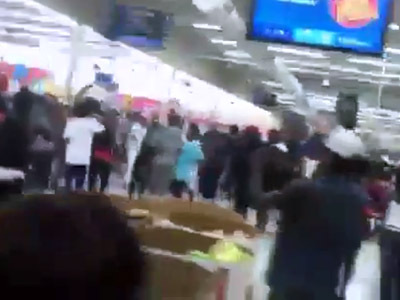 At a Walmart store in Garfield, New Jersey, police had to pepper spray and then arrest a man after he argued with a store manager, and then became “belligerent” over a television, according to The Star-Ledger. When police intervened, the man attempted to attack an officer, the paper reported, landing the 23-year-old suspect in jail facing charges of aggravated assault of a police officer, resisting arrest and disorderly conduct, according to Garfield Police Lt. Martin Gray. And yet another Walmart was the scene of a stabbing late on Thursday, this time in Claypool Hill, Virginia. According to WVVA, two men were arguing over a parking space outside the store when one of them pulled a firearm, prompting the other to draw a knife and slice “down to the bone.” Both men were taken to jail on multiple charges. 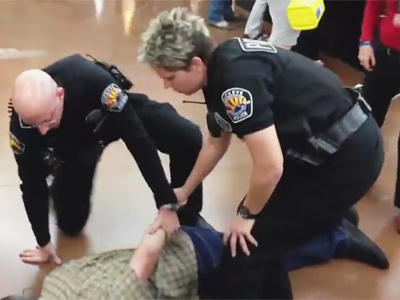 Local news reports and amateur video trickled in throughout Friday morning with reports of similar incidents across the country, but according to one shopper who saw a brawl unfold inside an unidentified Walmart, employees ordered him out of the store for attempting to videotape the incident. 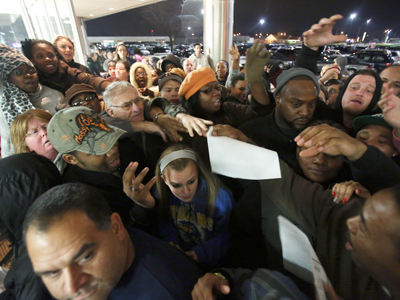 The man, Brian Spain, wrote on his YouTube page that he visited the store “went in, and expected to interview people about why they are there.” When he saw a horde of people piled on top of one another to get discounted merchandise, though, he began to film, provoking an employee to approach him and promptly remove him from the store, ignoring the violent altercation that had alerted him in the first place.